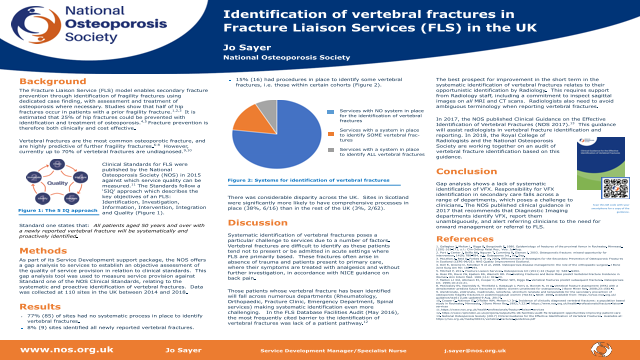 Fracture Liaison Services (FLS) prevent secondary fractures through systematic identification of fragility fractures using case finding, with assessment and treatment of osteoporosis where necessary. Services are measured for quality against the National Osteoporosis Society (NOS) Clinical Standards for FLS. Standard 1 asserts that all patients over 50 with a newly reported vertebral fracture will be systematically and proactively identified. This analysis sought to establish to what extent this standard is being met in the UK. A rolling gap analysis of FLS provision for identification of vertebral fractures in patients aged over 50 was undertaken. This measured service provision against the national standard. Data was collected at 110 sites across the UK between 2014 and 2018. 77% (85) of sites had no systematic process in place to identify vertebral fractures. Only 8% (9) sites identified all newly reported vertebral fractures. 15% (16) had procedures in place to identify some vertebral fractures, i.e. within certain cohorts. There was considerable disparity across the UK. Sites in Scotland were significantly more likely to have comprehensive processes in place (38%, 6/16) than in the rest of the UK (3%, 3/94).